What makes yoga inversions so exciting? From speaking to Jenny and Anna from Comfort Health whom both practice yoga, they explain that it is exciting due to the fact we are using our arms and heads in ways we do not normally do. Many of you will remember (before the days of phones and tablets!) playing as a child, trying handstands and cartwheels. The hugely challenging nature of inversion yoga (as well as being a lot of fun!) is creating a rapid growing in popularity. But are we strong enough to spend time upside down? Or in our quest to use yoga to increase strength, are we in fact leaving us susceptible to injury? The nature of inversion yoga, be that a down dog or a more challenging supported headstand, our necks can bear the brunt of injuries. This is not only due to the compression of standing on our heads. 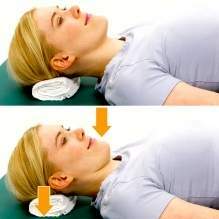 Our lifestyles now are generally not conducive to a good posture and strong core – sitting at desks, driving cars, using our mobiles… This can cause weakness in our neck flexors and scapular stabilising muscles, leaving our necks very vulnerable when performing inversion exercises as our more dominant upper trapezius and neck extensor muscles take over. There is hope though! Before you start your new ventures of exercise upside down, add these to your exercise routine. Standing or sitting (make sure you are sat up nice and tall, no slouching) Draw your shoulder blades back and down. Imaging your shoulder blades melting down your back. This can be performed in the gym with a cable machine or at home with the use of a theraband. Keep your elbow straight but soft, pull your shoulder blade back and down as you pull your arm down to your side. Work to keep your shoulders back and down as the cable / band lifts your arm back up. Great for your posture, reducing neck pain and addressing the imbalances caused by daily slouching. Sitting or standing tall, keep facing forwards whilst tucking your chin in so that you feel length up the back of your neck and a gentle tension at the front. This can also be competed lying on your back. If you would like assistance and guidance with regards to your strengthening, please get in touch. Jenny can help you with specific sessions to address muscular imbalances. Anna offers 1:1 yoga sessions in clinic.